Be quick with your vacation plans! Summer is on its way, and no one wants to be stuck inside when there’s a gorgeous world out there for you and your family to explore. A fantastic destination that has been flying under the radar for years is the islands surrounding Africa. With a diverse climate, the continent itself holds many beautiful sites that have welcomed tourists from all over the world to enjoy these natural beauties. Pico Cao Grande is most definitely one of them. Pico Cao Grande, also known as “Great Dog Peak,” is located on the coast of the southern part of Sao Tome. It’s a small nation, sharing dominion with the tiny Principe, and resides in the Gulf of Guinea in the Atlantic Ocean. Pico Cao Grande is the perfect place for those who desire a bit of exoticism and adventure in their lives. It is a part of the volcanic mountain range that covers both the islands of Sao Tome and Principe. Don’t worry about staring in your own version of the destruction of Pompeii because these volcanoes are extinct. The difficult parts of Pico Cao Grande lie in other areas. The Great Dog Peak never fails to lure in a thrill-seeking climber, ready for a challenge, and this is one huge challenge. The locals have dubbed the Great Dog Peak as being the un-climbable. When it rains in Sao Tome, and it rains quite a bit in this tropical terrain, a heavy, thick fog drapes itself over the mountain range, making the rock slippery, and it doesn’t help that the entire thing is covered with moss. The fog also makes it difficult to take pictures of the volcanic tower, so the pictures seen here are a real treat. It’s considered the 37th tallest mountain in Sao Tome, so imagine what other great sites this island has to offer. This site is great for hiking and climbing. It’s the source of many disappointments as year after year, people try and fail to reach its tip. Other than defeat, the Pico Cao Grande allows climbers to see the amazing landscape that surrounds the mountain. With a moist atmosphere surrounding the Pico, it isn’t surprising that a healthy, almost bulletproof jumble of forest surrounds the mountain. This area is home to many exotic creatures and wildlife, but most notably, there is an excess of snakes all throughout the range. 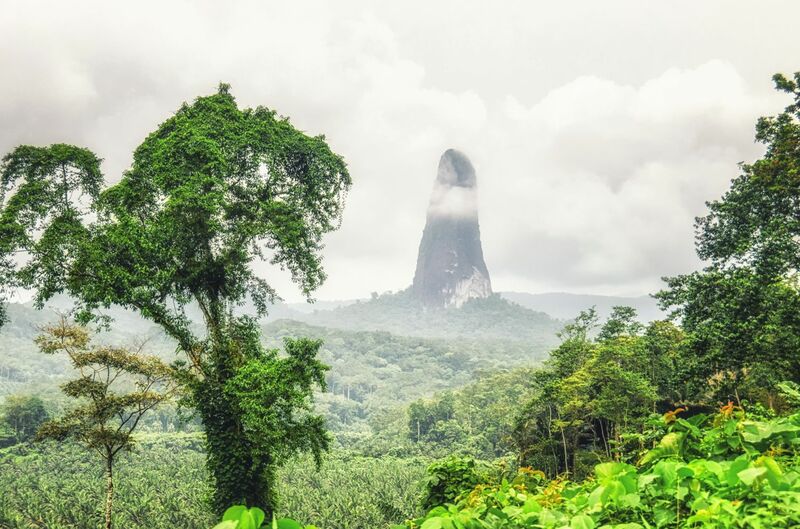 The Pico Cao Grande is recognizable by its pointed tip, often described as a needle, and its people have been known to call it “The Dark Tower.” The tower rises to over three hundred meters off the ground (that’s a thousand feet!) and seems to be pointing at the sky eternally. It’s considered a volcanic plug, created when the lava of another volcano formed hardened magma over the mouth of an active volcano. The Pico Cao Grande is a site that is a must-see, but like with any dangerous endeavor, must be pursued with caution.